Many online platforms allow users to run an online store and sell their products online. From product displays to store design to online payments to order tracking, these platforms help business owners with end to end solution. When looking for an online store builder for your business, selecting from BigCommerce and Shopify is the toughest, as these both are aces in the lineage of platforms. A positive aspect about both these stores is that none of them charge you a processing fee. 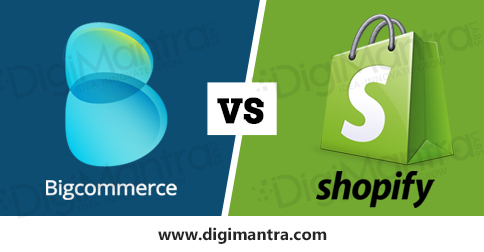 However, the number of active customers on Shopify is much higher than that on BigCommerce. But this isn’t the only differentiating factor between these two platforms. Let us look at some other differences in these stores so that making a choice is easier for you, based on your priorities and requirements. Store Design: The design of a store enhances its look and feel and makes it more appealing for the shopper. Shopify has many design templates which appear to be better than BigCommerce. These templates, being designed by professional designers, help your products look better. BigCommerce offers a limited choice in templates. So if you are looking for a better look and feel and customized designs, Shopify is an obvious choice. Feature Upgrade: Rare and upgraded features are available in BigCommerce, whereas in Shopify you require apps to enhance more features. The custom package of Shopify provides only a limited set of basic features. If you want to use features like product review, wish list, recommendations etc, you will have to pay extra charges for these features. However, you must use these if these are important and required. BigCommerce does not charge extra for the additional features it provides. Those looking for better features in an online store builder must go for BigCommerce. Profile Management: Starting your business at Shopify is much easier as the profile can be easily configured. Therefore, for businesses looking for a quick start-up process, Shopify is the right choice. You may perform easy steps and start selling online. Transactions: Payments at Shopify for customers from UK, US and Canada are easier now. The payment gateway for users can be managed via Shopify’s dashboard only. This option allows the provision for real-time status tracking of the payments made. Another provision here is allowing the customer to still use PayPal. Many customers prefer to make payments using PayPal. It saves them the pain of dealing with other external payment gateway providers, and you can also manage incoming funds easily.